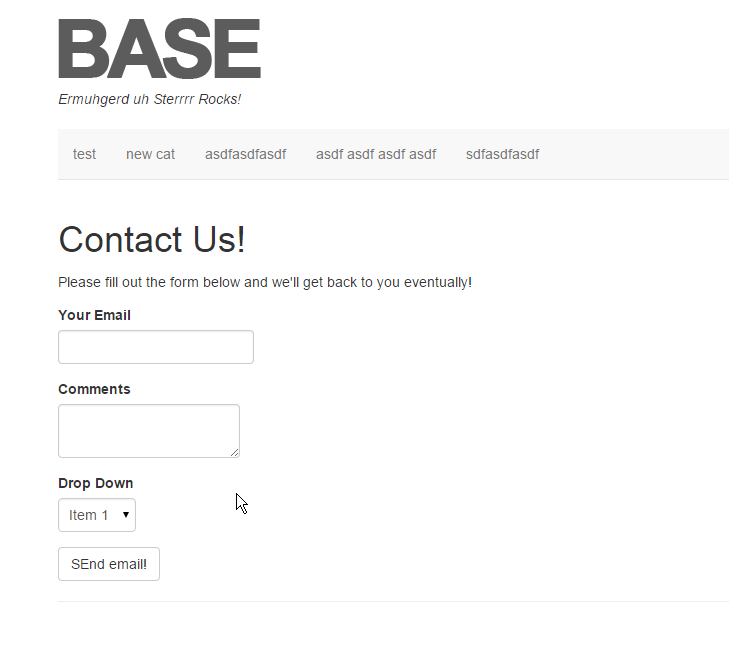 For more information on adding a contact form to a page, take a look at this article. 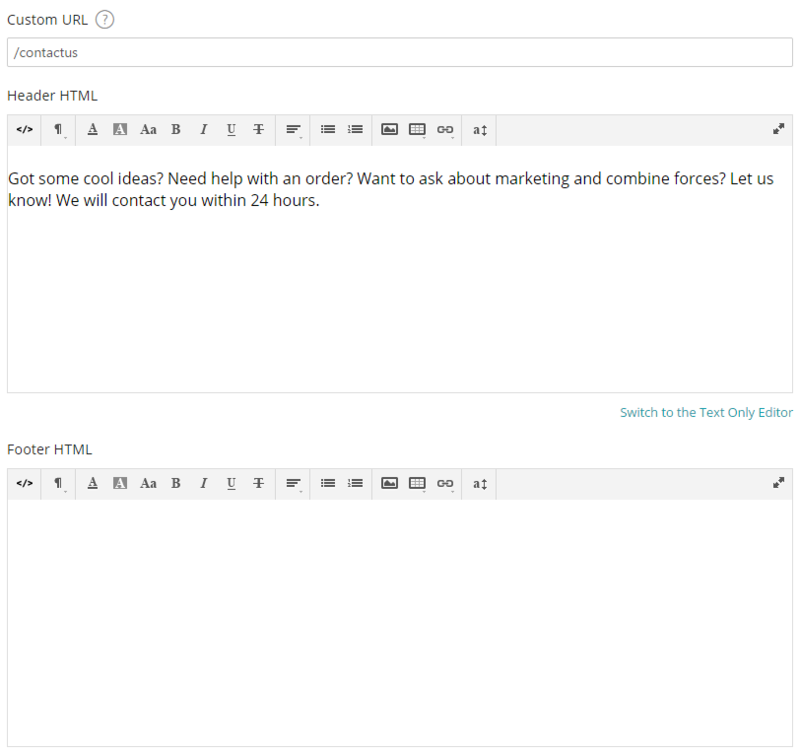 Contact form marketing is sending messages to website owners via their contact form on their website. It gives your customers the opportunity to quickly send messages to the store via email. Here you will see all the fields to create your custom contact form. A site can now have multiple contact forms that send to different places. Forms exist as their own page type and can act as a Contact Us page OR can be used via a widget anywhere on the site. You can also give it a custom URL to make it easier for your shoppers to get to. 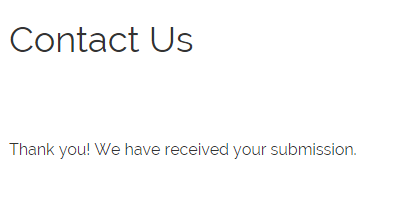 The "Send To" email is the email you want the forms to be sent to. That way, if you have multiple forms they can have separate email addresses if necessary. Forms also can have Header and Footer HTML that would go above and below the form on the page. Fields are rearrangeable by dragging and dropping and fields can be marked as Required. Just enter the Item in the text box and hit enter to add and save. These are also rearrangeable with drag/drop. The success message is also “settable” via the form editor and can be different for each form. This can be formatted with HTML and can be personalized to fit your store with the WYSIWYG editor. Where do we get the merge code for a custom form so we can insert it into a page? I am trying to add it as a widget to a page but there is no way to select which of my custom forms I am trying to add - it just has "Contact Form" as an option, and it seems that perhaps a merge code is how you associate it with the corresponding custom form..? 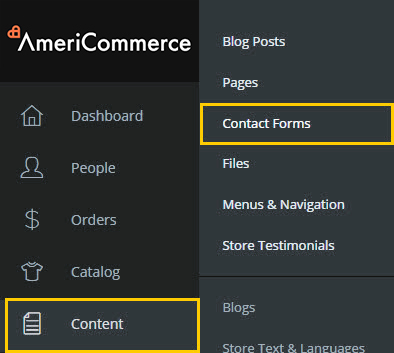 Eric, To do this you can follow this link <a href="https://americommerce.zendesk.com/hc/en-us/articles/204983764-Adding-Contact-forms-to-Content-Pages" alt=" Adding Contact forms to content pages" >Merge Code</a>. Basically you go to the page you want it on. 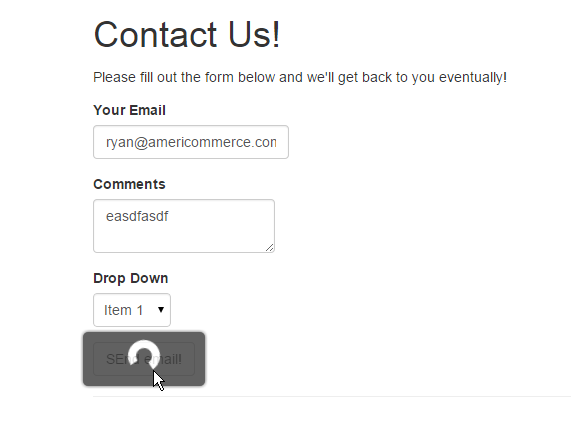 Create a contact form widget and then scroll to the bottom and click Enable Merge Code. Make sure to copy the merge code and then paste it into the page where you want it. How do you adjust the default sizes of individual text boxes? There's not a setting to change the size of the input text boxes; however, CSS can be used to resize them. Use your browser's inspect element on the input boxes to get their ID/Class; then use that to target the input boxes in CSS. Is the data from the submitted contact forms stored anywhere? Or are the emails the only record? Unfortunately I believe it is just the emails. Massive oversight if you ask me, because they are relying 100% on email reliability, which we all know is impossible. As far as I know, there is no ability to cross-reference submissions (or even a count) or anything to see if you missed a lead.